By many measures, public opinion across the Western world in the last few decades has become increasingly conservative. Issues that were seemingly “settled” years ago, such as abortion, homosexuality, contraception, feminism, socialized medicine, gun control, global warming and many others are today hotly contested, and some are even losing ground. Western youth in particular are experiencing a surge in adherence to traditional moral values and a growing opposition to socialist, anti-family policies. The annual March for Lifein Washington D.C. and La Manif Pour Tous in France – attended by hundreds of thousands of young people – are two examples. Many youth today are organizing to resist anti-family policies that are being imposed on society by the government with the support of academia and the liberal media. 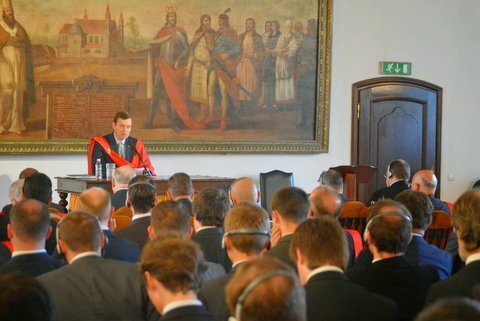 One event where this conservative trend was on full display was the 2014 International Student Conference, held in Niepołomice, Poland from July 23-27 and sponsored by the European Societies for the Defense of Tradition, Family, and Property (TFP) and the Fr. Peter Skarga Foundation. More than 120 students, activists, and youth leaders from 21 countries in Europe and the Americas gathered for a week of prayer, study, and training to more effectively bring pro-family, Counter-Revolutionary know-how and activism to their respective countries. The daily program was packed with talks on many topics, from Counter-Revolutionary goals and methods, to the principles of organic Christian society. Attendees were eager to learn about successful strategies and tactics and about the many historical examples of victory in the fight to defend Christian civilization. Many speakers gave presentations with stories of successful campaigns in defense of the unborn and the family. In addition, conference participants went on a guided tour of downtown Krakow where they had the opportunity to visit many beautiful sights in the former capitol of the Kings of Poland, including the imposing Wawel Cathedral, the gothic basilica of St. Mary, and the Jagiellonian University, the oldest university in Poland. Such sights gave participants a greater appreciation for the Christian roots of Europe and the civilization for which they are fighting. Enthusiasm, unity, and a strong sense of purpose was in the air. Students and activists from Estonia to Portugal, The Netherlands to Italy, and the United States to Argentina exchanged stories of struggles and victories, giving everyone hope for the future and a greater determination to fight in defense of Christian civilization. Conference participants were honored by the presence of His Excellency Athanasius Schneider, Auxiliary Bishop of Astana, Kazakhstan. Bishop Schneider heard Confessions and celebrated the Holy Sacrifice of the Mass daily and gave an informative talk on the life of Pope Saint Pius X and his fight against Modernism in the Church. A special "guest" of the conference was the International Pilgrim Virgin Statue of Our Lady of Fatima. The historic statue -- which miraculously wept in New Orleans in 1972 – was able to stay for the duration of the conference. A 24-hour prayer vigil was organized in her presence, beseeching the Blessed Virgin to shower the conference with graces and new fortitude for the noble fight ahead of us. Duke Paul von Oldenburg delivering his keynote speech. TFP International Student Conference: How to React 50 Years after Sorbonne? You will help moral values win by getting our weekly updates. Join us or support our efforts on the front lines. © 2019 TFP Student Action.